This weekend, Ally McCoist took charge of his one-hundredth game as manager of Rangers; to put it lightly there has been many more lows than highs with the legendary striker in the hot seat. Of course it has been the most difficult period of any Rangers manager. The demotion to the fourth tier, the transfer embargo and yes sorry I am going to use it - the lack of pre-season last year. This hasn’t done McCoist or his backroom staff any favours, even before that the encounters in the transfer market under Craig Whyte’s watch, although we all can admit, that’s a totally separate issue from McCoist’s managerial ability. As fans we’ve had to sit and watch his time in charge and let's be brutally honest it’s been embarrassment after embarrassment on the field. Right away back as far as playing five at the back against Malmo at Ibrox, a shocking exit which was the debacle against Maribor in the Europa League was just every bit as shocking and let's not erase both cup exits to Falkrik and Dundee Utd which were less than pleasant. To be fair to McCoist, long after the European exits we did play some good football and raced to the top of the league with a seven-point lead at Christmas which was encouraging. We all know what happened from February onwards – let's not go over it again. 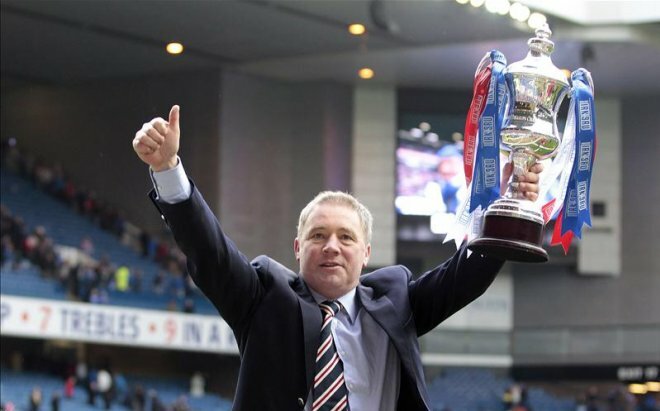 Last summer yes it was a difficult one for everyone connected to the club – McCoist showed superb leadership qualities, with his infamous "We don’t do walking away”" comment to the reporters outside Auchenhowie in the club’s darkest days and his contribution along with Walter Smith and the supporters’ groups to the RFFF. The product on the park however was poor and turgid for most of the season with many of the new signings under-performing. Ian Black and Fran Sandaza to name but two – the latter is best forgotten after his displays in the blue shirt. Again a victim of embarrassments; losing at home to Annan Athletic, away to Stirling Albion, two comprehensive defeats to Dundee Utd and Inverness in the cup competitions along with the Ramsden's Cup quarter-final defeat to Queen of the South on penalties. Although the positives were the two-nil victory over Motherwell in the League Cup and the emergence of some young talent mainly. Lewis Macleod but others too such as Robbie Crawford, Barrie McKay and Fraser Aird. All that being said the start to this season has been very good, the need for the team to be fitter has been noticed and McCoist has rectified it with his now nine new signings who have looked the part. It has to be said there has been many questions over McCoist’s ability as a manager and his tactical nous. Now he has players, maybe too many, that he trusts and is comfortable with. They look the part and are playing football in the correct way by trying to entertain the fans, the Forfar match apart I’ve seen a huge improvement in terms of fitness, hunger, desire and ability so here's hoping it can continue for the rest of the season. As long as McCoist continues to improve – here’s to the next 100 games in charge and lets hope it’s another successful period in the club's history.